Google Spreadsheets provides powerful charting functionality to let you analyze your data many different ways. 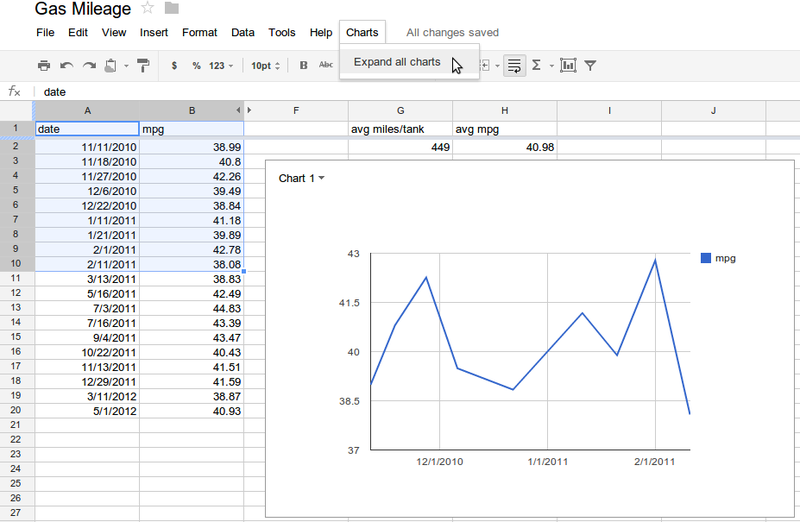 We recently added the ability to programmatically create, modify and delete Spreadsheet charts using Google Apps Script. 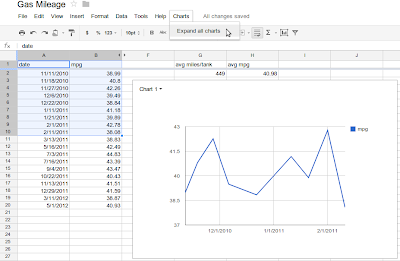 Charts that a user creates in a Google Spreadsheet are called Embedded Charts. Apps Script can be used to manage these types of Spreadsheet Charts. Each EmbeddedChart belongs to a Sheet. Embedded charts are named this way because they are embedded onto a Sheet within the spreadsheet. Embedded charts align to the upper left hand corner of the specified column and row in the spreadsheet. Let’s say I want to track my gas mileage using Google Spreadsheets. First, I create a Spreadsheet, and set up columns and formulas. 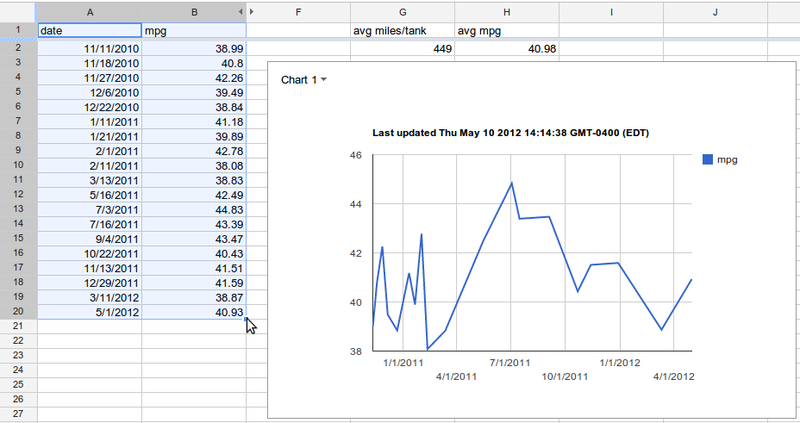 Next, I add a form interface to make it easy to add new entries and a chart to visualize my mileage. Now I can start recording data - but each time I add enough entries to go past the ranges the chart uses, I need to manually increase them. How about we use some Apps Script magic to solve this? The script below iterates through all charts on this sheet and determines if any of the ranges need to be expanded (i.e. if there are more rows with data to display). It then updates the title, builds the new EmbeddedChart object and saves it to the sheet. It could also add a menu interface or a trigger to execute this periodically or when the spreadsheet is edited. // Get a list of all charts on this Sheet. // Returns an EmbeddedChartBuilder with this chart’s settings. // rangeShouldExpand_ is defined later. // Removes the old range and substitutes the new one. // Must be called to save changes. // it’s probably the same type of data and should be expanded. What if you wanted to create a new chart from scratch? You can do that too! In the above code example, we’ve gotten a reference to an EmbeddedChartBuilder, set its position within the sheet, change the chartType, add the currently selected range and insert the new chart. Add/Remove the ranges this chart represents via addRange and removeRange. Set options that modify how the chart will be rendered as well as change the chart type with setOption and setChartType. Change where the chart will be displayed (the cell and cell offset of the chart container) via setPosition. // Attach all charts from the current sheet to an email. We hope you found this blog post useful. 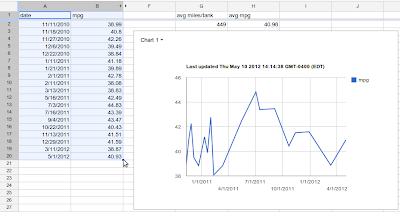 Enjoy editing embedded charts using Google Apps Script! Kevin is a Developer Programs Engineer in the AdWords API Team. He maintains the latest version of the Python and Java client libraries for the AdWords API. You can find him in the New York office.